Pool can be heated from May 2018 onwards! La Rueda, our cortijo and the cottage we rent, is situated 5km outside Orgiva in a hamlet called Los Agustines, at the southern foothills of the Sierra Nevada. This is still a 'living' community of mainly vegetable farmers who till their land below us mostly by hand. Sit in your hammock and watch them. Often one of our lovely neighbours knocks on the door to share his produce with us. Every afternoon some goats with bells around their necks make their way down to the fields, or Paco or Jose go by with their mule. This place really is as idyllic as it sounds! Our cottage is set in its own small garden and is surrounded by lots of lovely colours and smells. If you don't feel like cooking and want to have a relaxing time, let us know and we will prepare you breakfast and/or a lovely surprise dinner menu on one of our charming terraces! Come, relax and enjoy! What can we tell you about us? We, that is Stefan and his wife Naomi and of course the lazy cats Blackey, Tamy and Felix. (He, Austrian, she, British; cats, Spanish) We are all very lucky bums and enjoy every day anew living in this wonderful, wonderful part of the world! After many years of travelling the world, we happened upon this area and fell in love with it. First we rebuilt La Rueda and then bought another fallen down ruin in the Guajar valley, which we did up into La Cueva, a very special and cozy property. Come and see for yourself, why we enjoy living here so much! This place is magic and we bought it without thinking long, we just knew that this was it!! And we never will regret it and are greatful every day anew to be able to live here. Like one guest wrote in the guestbook:" paradise is only half as nice!" We are out in the campo, in a little hamlet, with extremely friendly and warm neighbours, who forever knock on the door to share some produce with us!! Yet we are only 5 ks away from Orgiva, that offers everything we need. Great place to live and be! La Rueda is a quiet place out in the countryside, surrounded by lots of flowers and trees with all its perfumes. The perfect place to unwind and soak up positive energy! Sit by the pool at night and stargaze or watch the moon rise or set... just come relax and enjoy! The pool is all yours to enjoy! Notes on accommodation: The pool is tiled and has a wave maker. There will be use of a washing machine, iron and ironing board. During the cooler month of the year we offer central heating apart from a woodburning stove. All linen and towels are included except for pool/beach towels. Outside: Small Mediterranean balcony with views over garden, valley and mountain chain across. Private patio and garden with its mandarin orange, peach and pomegranate trees and sitting area. On a lower terrace the tiled pool (complete with wave maker) is all yours, unless you let us share it with you. There is a BBQ area and another Moorish style sitting corner under a centenary olive tree. Wherever you sit, you can enjoy the lovely views over the valley below and the Contraviesa mountain chain across. You bring your own laptop? On our terraces you have now wireless access to the internet. If you don´t bring your own laptop and need to use a computer, just ask us. We had a wonderful week with Stefan and Naomi. We appreciated the nice, warmhearted welcome by the two as well as the cozy apartment and the beautiful garden. The location of the domicile is a good starting point for a variety of activities. For example, we have been hiking a lot, visiting Granada and enjoying the sea at Nerja. We can only recommend the accommodation! How to experience Spain at its best! We spent a much needed 2 weeks in this beautiful tranquil casita set in the stunning Las Alpujarras region of Southern Spain. If you want a taste of Spanish life this is the place! Close enough to the nearest town of Orgiva to buy all you need for your stay but set in a rural location giving you peace and privacy and total relaxation. The dear little casita is perfect for a couple and set in a most stunning terraced outdoor space with plenty of sun and shade and best of all ..... the most perfect pool with views over the valley. A car is recommended - not just for trips to town but also to explore the heartland of Las Alpujarras and it's typical sleepy white villages dotted throughout the stunning Sierra Nevada mountain range. Stefan and Naomi, the delightful owners, live next door and are on hand to help with anything you might need. If you want real Spain then get booking!! Very well looked after peacefull place with lots of flowers and an amazing view over the valley. The very friendly and welcoming owners are living next door but we hardly seen them. 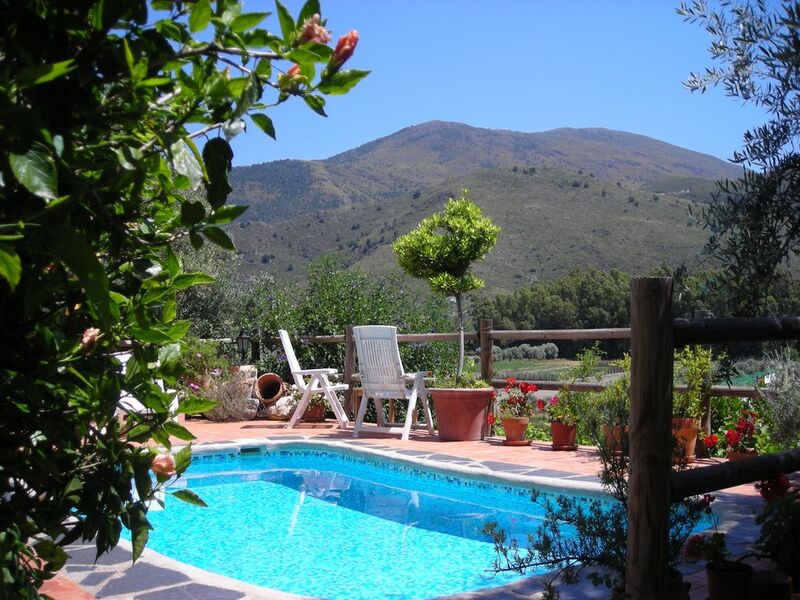 A perfect place to enjoy rural andalucia and come to complete rest. Stefan et Naomi, connaisse bien leur région et nous ont très bien renseigne pour nos sortis ,il sont polyglotte anglais allemand espagnole et un peu de français donc pas de problème . d’égale que la beauté de leur petit paradis. nous serions bien reste plus longtemps . Wir sind sehr froh darüber während unserer ersten Andalusienreise Stefan und Naomi und ihr traumhaftes Häuschen unter den Bergen Sierra Nevadas kennengelernt zu haben. Die Unterbringung in La Rueda hat all' unsere Wünsche erfüllt und in vielen Hinsichten übertroffen. Die Schönheit dieses Plätzchens lässt sich auf keinem Bild so darstellen wie es in Wirklichkeit ist - der Duft der vielen Blumen, das Vogelzwitschern, der Blick auf die Berge (aus dem Pool!)... ein Naturschauspiel, welches einem auf seiner Rundreise durch Andalusien auf keinen Fall entgehen darf! Wir bedanken uns herzlich für die warme Gastfreundschaft, die wir erleben durften und die tolle Erfahrung, die uns noch lange in Erinnerung bleiben wird - bis uns die Sehnsucht wieder vor die Tore von Los Agustines verleitet. A wonderful place to relax and let the world go by ! The studio is very comfortable, the pool was gorgeous and the views stunning. Stefan and Naomi were always at hand for local information. Thoroughly recommend! The nearest beaches are from half an hour away. Salobreña, Almuñecar, La Herradura or Nerja to name only a few. Between La Herradura and Nerja are a couple of unspoilt and very private little coves, bring your picnic and enjoy the tranquility. Enquire about diving in the diving centres of Marina del Este or La Herradura. Malaga is 1 1/2hrs and Almeira 2 hours away. Details of airlines offering cheap flights will be provided upon request. A car is highly recommended - pick up from airport can be arranged. New: Ryan Air now flies directly to Granada (1 hour from us) from London Luton and Liverpool. Stansted and Manchester now also offer flights to Granada, also Paris, Milan, Amsterdam and Geneva. The nearest beach at Salobrena is 30 mins away. Granada 1 hour, Las Alpujarras 20 mins, Nerja with its caves and the nearby beautiful village of Frigiliana are about 1 hour away. Cordoba, Jaen, Guadix as well as Nijar and the coastal nature park of Cabo de Gata can all be visited as a daytrip. Come and relax! You want to be active? Then join us for coffee and cake in the afternoon! Maybe you'd like to be included in the daily activities? Then help us or our neighbours to pick olives or harvest vegetables or just watch us doing it. You can go for short walks or longer hikes - down into the country past all kinds of exotic trees and/or up into the hills and mountains of the Sierra Nevada. A short stroll into the country is highly recommended during the full moon! Sit by the pool at night with your favorite drink, switch off all the lights and enjoy the moonrise or set, awesome! On moonfree nights you can stargaze and explore the whole milkyway and don´t forget to make a wish with one of the many shooting stars. Go sightseeing in Granada with its famous Alhambra (50 minutes away) or visit the white washed villages of the Alpujarras (20 minutes away). Ask us about local handicrafts (pottery, weaving, leather weaving) and woodworks etc. Orgiva (5km away) offers everything you might need - there is a colourful weekly market (Thursdays), daily market, shops, cafes, bars, banks and ATMs, dentist, doctor, internet cafe etc. If you are looking for more activity then ask us about horse-riding, guided hiking trips as well as reiki, reflexology and different types of massages - all of these can be arranged. Maybe you are looking for Spanish lessons? This is your home from home, just lean back and unwind! We speak English, German and of course Spanish. Booking Notes: A deposit of 20% is required as confirmation with the balance due on arrival. A 10% discount for late bookings (within 2 weeks of arrival). Changeover Day: The changeoverday is flexible in order for you to be able to book the most suitable and economical flight.The arrival and departure times also are flexible. During winter we provide firewood, for which we will charge extra on site.